Published August 12, 2015 By Leisa Good This post may contain affiliate links. Regardless, I only recommend sites I've researched and/or used and trust. Are you a nurse who wants to stay home with your children? Do you feel that because you are a nurse and not a freelancer, you can’t stay home with them? Would you like to figure out a way to practice nursing and to stay home with your children? Well, then becoming a work at home nurse may give you the best of both worlds. 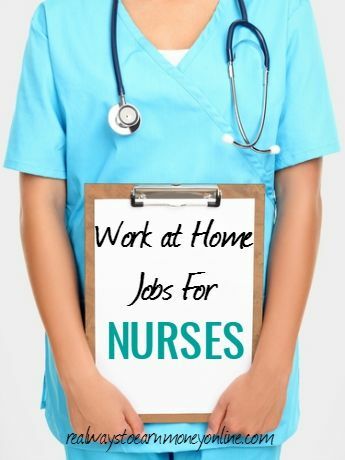 What Are Some Work From Home Jobs For Nurses? Many nurses who work at home are advice nurses. Medical insurance companies such as Kaiser Permanente have been employing advice nurses since the late 1980’s. Many of them were telecommuters or working in an office at that time in history. Advice nurses are still around and do just that. They give advice to parents calling in and wanting advice on how to care for a sick child or patients wanting to know what to eat if you are on a low-potassium diet. Advice nurses can also work from home, and can be used by both medical call centers and/or insurance companies. Some nurses also telecommute as case managers. Many work-at-home nurses practice telephone triage, which is answering patient calls and using protocols to rank the urgency of the call. Sometimes calls will have to be escalated to physicians or others on duty. The difference between an advice nurse and a telephone triage or “telehealth” nurse is that advice nurses generally offer advice on diet, exercise, and non-emergency questions. These would be questions that would not have to be ranked or escalated. Writing for online medical journals is another way nurses may contribute to their profession while staying home with their kids. What Are Some of the Companies That Hire Nurses to Work From Home? About.com Health Channel – This company, About.com, hires nurses through Health Channel to write on topics such as nutrition, dieting, sleep problems, childhood illnesses, and many others. Nurses should be experts in the fields in which they write. Carenet – This Business Process Outsourcing (BPO) contracts with insurance companies to provide virtual call centers (i.e., the nurses’ homes) for RNs (register nurses) to answer patient questions and perform telephone triage. Cigna – This company hires RNs to work from home as worker’s compensation case managers via the telephone. All hiring is done out of the New York office. To find the home-based jobs, type “work from home” or “remote” in the job search keyword box. Conifer Health Solutions – This company hires both RNs and medical coders to work from home. Nurses answer questions from patients and also may assist the medical coders if they have any questions. Doctors on Demand – Read Review – This company hires people with at least two years of healthcare experience and two years of customer support experience to provide online support for their service. Pay is between $16 and $18 hourly depending on your experience. This position is not always open. Humana – This health insurance company hires RNs to work from home and perform telephone triage and answer patient questions. When you are browsing their jobs page, you can select the “Virtual/Work at Home” checkbox for your job search criteria to narrow it down to the home-based jobs. Most companies that hire nurses to work from home hire them as either part-time or full-time employees instead of independent contractors. Also, the majority of these and other companies will offer benefits such as paid holidays and 401(k) plans as well as medical and dental insurance. Many of these companies also offer 24/7 telephone service to their patients as well. When applying to any companies offering at-home nursing jobs, make sure that you are licensed in the states listed. Even though most companies are national, not all of them will hire in 50 states. Based on your nursing experience or lack of, you may be asked to work on-site for a while before being allowed to work from home. Again, every position and every company are slightly different in the requirements, so make sure that you have read and understand what is required. Go to any of the above sites and follow the instructions for applying. You can also type in words such as “remote” (without the quotes) in the location fields. Indeed and FlexJobs are also excellent job boards to search for home-based nursing positions through a variety of different, reputable companies. Great list! Other tried and true work from home options are mentioned here: http://www.rasmussen.edu/degrees/nursing/blog/real-work-from-home-nursing-jobs/.